Lamborghini chose the Paris Motor Show to unveil its latest one-off concept car, the Asterion. Described by the Italian supercar manufacturer as a 'technology demonstrator', the Asterion is the first Lamborghini model to be fitted with a plug-in hybrid drivetrain. Using the company's familiar 5.2-litre V10 petrol engine, which currently powers Lamborghini's entry-level Huracan model, the Asterion mates this 602bhp motor to three electric units – one situated within the gearbox sending power to the rear wheels, and two more powerful motors on the front axle, providing drive to the front wheels. The combined power of the electric motors is 296bhp, bringing the total output to a stratospheric 898bhp. However, despite the huge reserves of power, the Asterion is something of an eco-champion, being able to run emissions-free on electric power alone for up to 31 miles (at up to 78mph), thanks to a large lithium-ion battery pack, mounted low in the centre of the cabin. The battery pack is charged on the move by recuperating otherwise wasted energy from the brakes and engine while decelerating. It can also be charged from a conventional wall socket. The combination of petrol and electric power sees the Asterion return remarkable performance and economy figures. Lamborghini claims combined fuel consumption of 67mpg, equating to CO2 emissions of around 98g/km – figures that belie the car's 3.0-second 0-62mph time and 199mph top speed. This new hybrid system is first likely to be seen in production form in the highly anticipated Urus SUV, which is still awaiting the go-ahead from Lamborghini's parent company, Audi. The Asterion was unveiled by Lamborghini president Stephan Winkelmann at a special media event prior to the opening of the Paris show last week. Unlike the extreme performance offered by the lastest crop of hybrid hypercars from Ferrari, Porsche and McLaren, the Asterion hasn't been designed for ultimate track thrills, with Mr Winkelmann describing it as "conceived more for comfortable luxury daily cruising," Autocar reports. 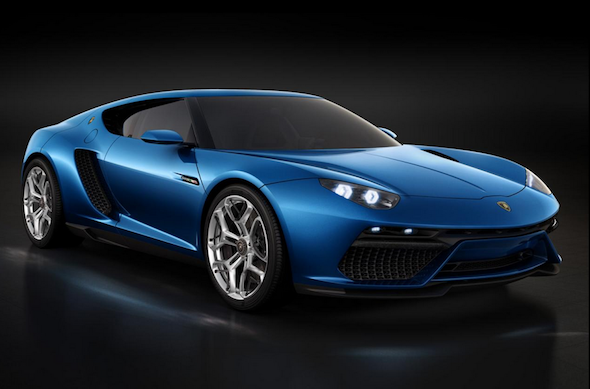 Lamborghini has released a short CGI video detailing the Asterion's hybrid drivetrain. Click play below to check it out.